A week later, we are still working our way through leftover Thanksgiving ham. We received a lovely ham gift basket from TommyMoloneys.com. The ham was about 10 pounds, and joined a large turkey and five sides to feed a group of eight. Needless to say, plenty of everything was left after the meal. While the other leftovers were polished off by Sunday, we’re still munching on lots of leftover ham. We developed this list of 41 recipe ideas, and have been ticking them off three times a day. Yes, it’s a ham-a-thon: a ham marathon. Let us know what we’ve left off the list. Ideas to finish our leftover ham. Photo courtesy FraMani.com. Cut it into single portions to defrost for lunch or dinner, or cube and freeze for soup garnishes, omelets, casseroles, etc. 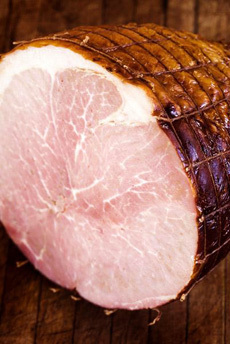 Find ham recipes in our Pork Section. Take our ham trivia quiz.